1). Remove the root and wash the keerai twice in plenty of water. Drain and chop it roughly, keep aside. Cook moong dal and keep aside. Grind the items listed under "to grind" to a fine paste, keep aside. 2). In a 2 liter pressure cooker, add 2tsp of water and 1tsp of oil. 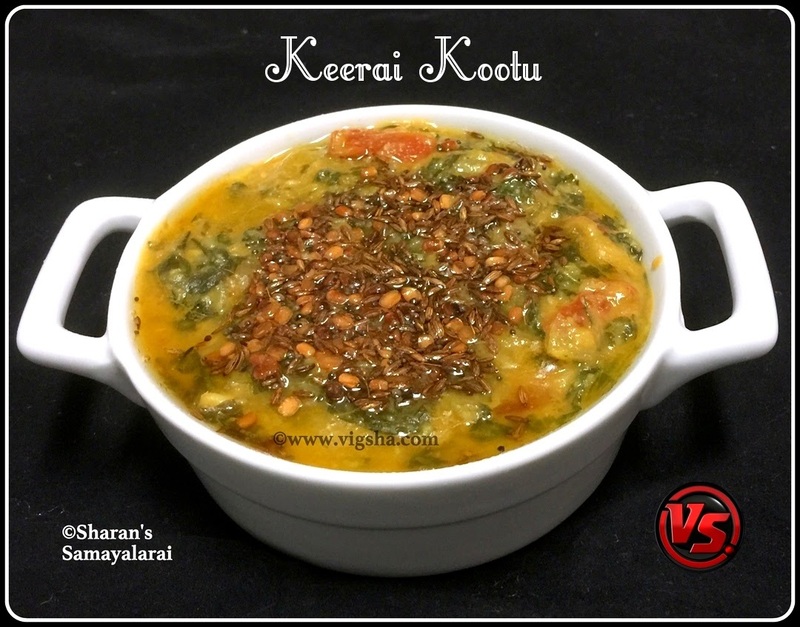 Layer chopped onions, tomatoes, keerai, tuermeric powder, sambar powder, garlic, salt and grounded paste. Close the lid and cook high for 2 whistles. 3). Release the pressure of let it go by itself. Heat oil in a pan, add mustard, urad dal and cumin and saute till dals turn golden. Top this seasoning on top of kootu. Done ! Serve with steamed rice with a dallop of ghee or as an accompaniment. If you enjoy reading my blog, Join my page on Facebook | follow me on Twitter | add me on Google+.